I’m old-fashioned, I admit, and this is another Friday cocktail post devoted to classic cocktails. It’s not because I’m nostalgic (though I am). It’s because classics are classics for a reason: they’re good. There’s a reason you don’t have a Swanson’s TV dinner in your freezer but will never tire of a well-made Martini. My dad was a Martini man. He was also an Ad Man (who actually looked a lot like Don Draper), a creative director at a Cleveland ad firm where I interned the summer after my freshman year of college. He was a gin drinker. I still remember my first revulsion at gin. I asked him what he had in that plastic cup of his. He told me it was a Martini. Go ahead, he said, taste it. I did. How on earth could he drink that stuff? I thought. Tasted like the worst medicine you could invent. He chuckled, had another sip, the light turned green, and we headed up Cedar Road toward Fairmount in the new 1972 convertible Ford Mustang. His brother Jon, eleven years his senior (my dad was a “gift” to his 39-year-old mother, both of them born on FSF’s birthday, I’m happy to note—thanks, Rose and Mike! Glad you didn’t take precautions! ), Jon was a Manhattan man. But like my father’s martinis, Jon’s Manhattans were made with the cheap stuff and always on the rocks. I’m pretty sure it was a practical decision. They simply drank too many of them to make it practical to serve them straight up in a chilled glass. Jon would have wavered his hands around his ears and called that kind of drink something for fairies. That was his generation. He was a big, bellicose man, CEO of an engineering company, a sailor who loved to race, brilliant, difficult, and fiercely loyal to and proud of his family. I never went in for the sweetness of the Manhattan when I began to have actual cocktails. I loved the austerity of my father’s gin Martini. So it was my dear Uncle Bill, Jon and Rip’s Uncle Bill, actually, Rose’s brother, the man who taught me the supreme value of a potato, quoted in The Making of a Chef, the man who guided my literary leanings and showed me by example what a genuine intellectual was made of, it was he who made me my first Manhattan, at his home in Santa Barbara. Donna and I had arrived terribly hung over after a late, late wedding celebration south of Los Angeles, and that Manhattan was nectar from the gods. The Manhattan is indeed a superlative drink when made properly. I ordered one earlier in the week at Nighttown, a Cleveland Heights, walking-distance bar that features some of the best jazz in the country. The bartendress made it with Bulleits. I didn’t ask about the vermouth. The person I was meeting asked have you had the Manhattan at Velvet Tango? No? Then you haven’t had the best Manhattan. I bought a new vermouth, just to try, pictured above (I didn’t have time to drive out to Solon for the preferred Vya vermouth, sorry Paulius). He, Paulius, owner of the VTR, also recommended Amarena Fabbri cherries. The only place he knew to get them in Cleveland was Gallucci’s, but they were out! So we had to go with the crappy ones that are better on ice cream. Here they are made palatable by the lovely metal skewer that belonged to my father and was part of that whole sixties cocktail. I love it. I was able to buy the most important ingredient though, Old Overholt rye whiskey (Jon drank VO, most of his 74 years). And given the cherries, I’m going with the good, if ubiquitous, Angostura bitters. I’m in Manhattan now, so a Manhattan it is, and I raise it to you, Jon and Bill, with great lasting memories and thanks. In a 2-cup measuring glass, combine the whiskey, vermouth, and bitters. Fill the measuring glass with ice and stir more or less continuously for 90 seconds (I hate the shaken drinks with all the shattered ice floating in them). It’s fine to pause while you retrieve your glass from the freezer. 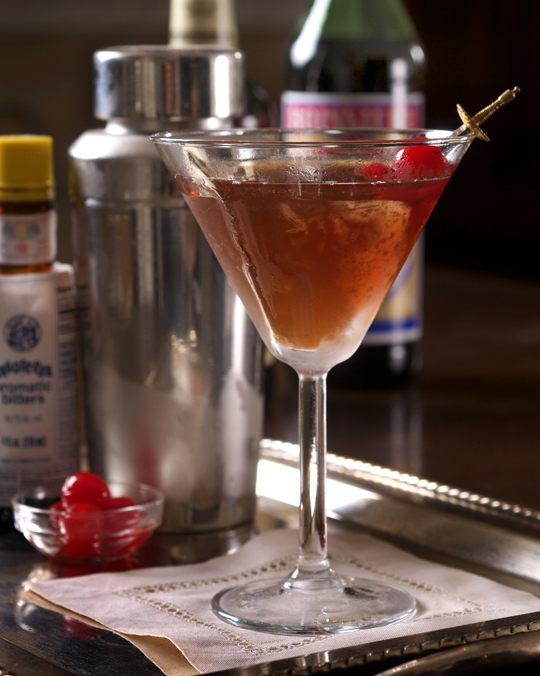 When the ice and alcohol have commingled for the appropriate time—you want about 30 to 40 grams of water to melt into the Manhattan—garnish it with the cherries. My recent posts on the Berkshire Martinez. Is rye whiskey back in fashion in the United States? Learn how to make your own maraschino cherries. Very nice design and style and superb articles , practically nothing else we want : D.
I have learned several important things by means of your post. I would also like to mention that there may be situation in which you will apply for a loan and never need a co-signer such as a Government Student Support Loan. However, if you are getting a borrowing arrangement through a standard banker then you need to be made ready to have a cosigner ready to help you. The lenders will certainly base their own decision using a few components but the most important will be your credit ratings. There are some financial institutions that will in addition look at your job history and determine based on this but in many cases it will be based on on your ranking. You have brought up a very excellent details , regards for the post. “For visions come not to polluted eyes.” by Mary Howitt. One more thing. It’s my opinion that there are many travel insurance websites of reputable companies that allow you enter your holiday details and acquire you the prices. You can also purchase your international holiday insurance policy on the internet by using your current credit card. Everything you need to do is always to enter all travel details and you can understand the plans side-by-side. Just find the plan that suits your financial budget and needs after which use your credit card to buy it. Travel insurance on the web is a good way to do investigation for a respectable company regarding international travel cover. Thanks for discussing your ideas. I simply want to tell you that I’m all new to blogging and site-building and really loved this web site. More than likely I’m likely to bookmark your website . You certainly come with fabulous writings. Cheers for revealing your blog site. Hello. remarkable employment. I did not imagine this particular. This is a superb story. Thanks! This is a really cool web site that I found when searching google. Hi, Neat post. There is a problem together with your website in internet explorer, may test this?K IE nonetheless is the marketplace leader and a big component to people will omit your magnificent writing because of this problem. This is a tottaly cool site that I found online. Magnificent web site. A lot of useful info here. I am sending it to a few friends ans also sharing in delicious. And of course, thanks for your sweat! Some truly good information, Sword lily I came across this. What you are doing speaks consequently loudly that i cannot hear what we say. by Ralph Waldo Emerson. Excellent – I should definitely pronounce, impressed along with your website. I had no trouble navigating via all tabs and related info ended up being truly effortless to do to access. I lately found what I hoped for before you know it at all. Quite unusual. Is likely to appreciate it for those who add forums or something, web site theme . a tones way for your customer to communicate. Outstanding task. Thank you for all of your effort on this site. Ellie take interest in getting into investigation and it’s obvious why. I notice all relating to the dynamic form you create very helpful secrets by means of your blog and as well inspire response from others on that area and my girl has always been learning so much. Have fun with the remaining portion of the new year. You are always conducting a good job. I don’t usually comment but I gotta state regards for the post on this one :D.
A really Hermes African american Pouch are generally with a lack of premium and they are generally repetitive. It is typically instantly destroyed and is also made hurriedly victoria beckham hermes. That may have a look at to your house together with notice the snags with blog post contained in the product, which might be possibly not fine wind resistant, cheek designing prevalent with an very first Prada wallet. Presently there are generally buckskin lottery tickets coupled with comprises low-priced resources.